BMW produced 15,200 R4 motorcycles using innovative mass production techniques, setting new standards of design and quality. Pressed steel frame and components were quick and easy to stamp out and assemble, reducing manufacturing costs. 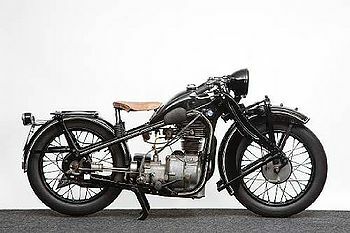 Introduced in 1932 and intended to bridge the gap between the 'budget' BMW R2 198cc single and the expensive twins, the R4 looked much like the former, whose channel-section steel frame and running gear it used almost unaltered. 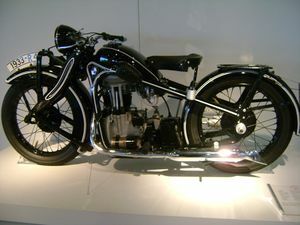 The 398cc overhead-valve engine featured enclosed valve gear and produced 12bhp, gaining an extra two horsepower in 1933 when the BMW R4 was updated to Series 2 specification with revised styling and a four-speed gearbox. A new cylinder head, tidier engine casings and changes to the toolbox and generator locations were introduced as the rugged R4 - a favourite with police forces and the German Army - progressed through to Series 5 before production ceased in 1936. This page was last edited on 20 January 2011, at 19:55.